Well here we are, having survived the beginning of a new year and more determined than ever to make it a better year than the last! Today I had a good laugh reminiscing about the things we used to sit around the porch and imagine as kids in the 70s, about the year 2010. No doubt our imaginations had been spurred by Television and hearsay. Movies like 'Land of the Giants' and 'Planet of the Apes' no doubt had us convinced that things could go either way. We could be trampled by Raging Giants or shot to death by Raging Monkeys! There was always Godzilla and King Kong to come and tear us a new one. 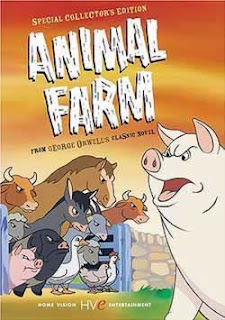 And of course, there was the 'Animal Farm' mind bender by George Orwell. Well as a youngster it was definitely a mind bender for me! And finally, the mid-80s SciFi prophecy, 2010. Whatever we imagined we could never have known that we'd be where we are today, computers, fashion, health, music, wow. Whatever the case, we did think things would be way out and futuristic. What did you think the year 2010 would be like? Admit it, you thought some futuristic stuff too! I thought life would be very mechanical. Everything run by robots and machines. I guess in a way, the machines... LOL. With the new year, new hopes, new prospects, new projects. I recently asked some survey questions for articles I'm writing and got tons of interesting answers. I'd love to hear what you have to say. What's the one sign in potential mate that will make you walk away fast? Well off to paint some more. Happy to be painting! Oh I did create some Artsy aprons.